Prescription drug addiction has, unquestionably, become one of the United States’ leading substance abuse threats, killing thousands of Americans each year and rendering millions more addicted and in the crosshairs of illness and overdose. We’ve been conditioned to believe that a pill can solve everything, from our sleeping problems to our pain to our anxiety and depression, and while these medications have proven instrumental in helping patients with a variety of conditions prolong their life, successfully manage their ailments, and improve their daily quality of life, they have also created a pervasive and deadly addiction epidemic the likes of which the nation has never seen. Prescription drug addiction requires comprehensive treatment at the medical and behavioral levels to help users successfully battle against this illness. The National Institute on Drug Abuse reports that nearly 54 million Americans have used prescription drugs for non-medical purposes at some point in their lives and that 25 percent of those who abuse prescriptions before the age of 13 wind up battling some sort of chemical dependency issue later on in life. Many of these cases will eventually follow the path to overdose and subsequent fatality. The agency also reports that prescription-drug related emergency-room visits have risen considerably over the past ten years and that nearly 13 percent of illicit drug users begin by using prescription opioids. Prescription drug addiction treatment has become an urgent and immediate healthcare need for all portions of the United States population, including urban, rural, and suburban locales. Additional data from SAMHSA indicates that prescription drug addiction is alarmingly high among adults and children. What Does Effective Prescription Drug Addiction Treatment Look Like? Prescription drug addiction treatment must address the physical, behavioral, and lifestyle consequences that users have suffered in the wake of their consistent abuse. This includes medically supervised detoxification (detox) and withdrawal management followed by comprehensive behavioral rehab. Rehab for prescription drug addiction can be administered on either an inpatient or outpatient basis and should be tailored according to each patient’s individual care needs. Inpatient Treatment – Patients stay at their treatment facility during their program to heal in a distraction-free environment. Inpatient treatment generally lasts between 28 and 30 days but can last longer, depending upon the patient’s ongoing care needs. Outpatient Treatment – Patients attend multiple weekly treatment sessions and return home at the end of each treatment sessions. Typical outpatient programs last about five weeks with three to five sessions per week. Partial Hospitalization Program (PHP) – Partial-hospitalization programs allow patients to stay at nearby housing, but not at their actual treatment facility. This means that patients have structure and independence during their treatment. Rehab will include group therapy, individualized counseling, and a customized package of supplemental modalities based on the patient’s care needs and conditions. 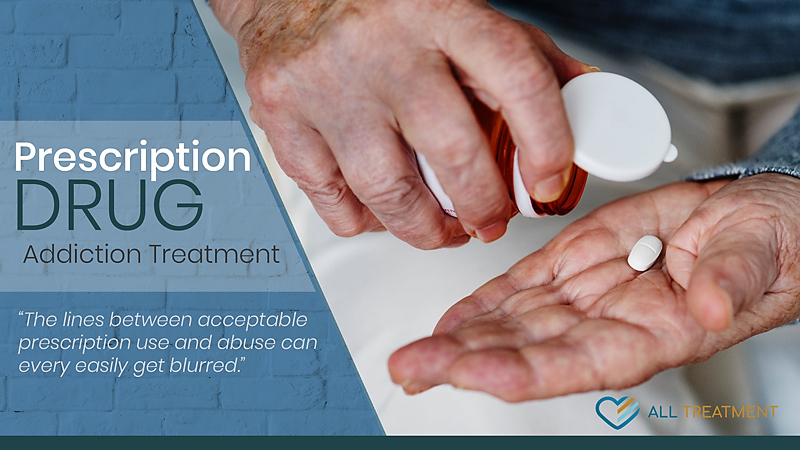 Patients who abuse prescription drugs usually start by taking them for a legitimate medical condition, so it’s very important that treatment address the condition for which they’re medicated as well. Aftercare plans should include insights regarding how to manage these conditions without the primary use of prescriptions, as well as information regarding addiction-trained therapists and support groups in the patient’s specific area. They should also include behavioral coping techniques to help patients avoid relapse in high-pressure situations. Whenever we talk about prescription drug addiction, there’s a good chance that opioid painkillers will factor prominently in the conversation. This is because these drugs are the most commonly abused, and deadliest, type of prescription medication. The Centers for Disease Control and Prevention (CDC) reports that there were over 72,000 drug overdose deaths, more than 49,000 of which were directly related to opioids, according to data from the National Institute on Drug Abuse. While the illicit opioid heroin was present in many of these deaths, the uptick was driven primarily by prescription painkillers. The synthetic opioid fentanyl (Actiq®, Duragesic®, Fentora®, Abstral®, Onsolis®) has been one of the most active drivers of opioid-related deaths. In the last five years, deaths from fentanyl have increased over 500 percent. Other kinds of opioid painkillers include methadone (Dolophine®, Methadose®) and branded prescription morphine (Kadian®, MS Contin®, Morphabond®). Opioid painkillers work by binding to the brain, spinal cord, and other areas of the body and immediately producing feelings of euphoria, providing relief from severe pain-related conditions. They are meant for temporary use in extreme pain-related conditions and should be monitored closely by the prescribing healthcare professional. Prescription painkillers are commonly used in cancer-related pain, post-surgical recovery, and various types of severe pain-related conditions. They are not recommended for the long-term treatment of mild chronic pain issues. 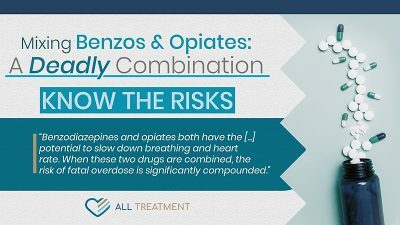 Right behind opioid painkillers in their prevalence among drug-related overdose fatalities are benzodiazepines. These drugs are central nervous system (CNS) depressants that dangerously slow heart rate and respiratory functions. Central nervous system depressants are commonly used to treat anxiety and other associated conditions. Many patients who need rehab treatment for benzodiazepines or CNS depressants will need dual-diagnosis treatment to address the underlying emotional issue that initially caused them to start using the drug. The National Institute on Drug Abuse reports that there were nearly 11,000 overdose deaths directly attributable to benzodiazepines in 2016, representing an eight-fold increase over the past 15 years. These drugs are particularly dangerous when mixed with alcohol. Each year, American doctors write nearly 50 million prescriptions for Xanax or its generic equivalent. While American physicians and healthcare providers have curtailed their dispensation of these drugs, there are still over 250 million prescriptions for psychiatric medications written each year. Drugs like Xanax and Valium are usually prescribed for legitimate anxiety disorder but have proven to be very vulnerable to diversion. The explosion of prescription stimulant dispensation over the past three decades has left children and young adults all over the United States increasingly vulnerable to abuse, addiction, and overdose. Stimulants are commonly used to help students perform better in school and increase their alertness and concentration. Young adults also take them to perform better at work and enhance their social experiences. This recreational use very often leads to addiction and the need for treatment. Data from the Substance Abuse and Mental Health Services Administration indicates that people aged 18 to 25 were more than twice as likely to use cocaine compared with other adults and that nearly 600,000 reported past-month methamphetamine use. A recent study from Johns Hopkins University revealed that Adderall-related emergency room visits have risen dramatically in the past few years. Prescription stimulants are generally used to treat attention-deficit hyperactivity disorder (ADHD) and the sleep disorder narcolepsy. As each type of prescription drug will be used to treat different conditions, they will have differing effects on the brain and body and cause users to present with different symptoms. If you or someone you care about is displaying these or any other symptoms related to prescription drug use, it’s possible prescription drug addiction treatment may be needed. The line between acceptable prescription use and abuse can very easily get blurred. Loved ones and friends of prescription drug users are uniquely empowered to intervene in their loved ones’ substance use and guide them toward treatment. One of the first signs of prescription drug abuse is denial and indignation regarding their level of prescription use. Don’t let yourself or your loved one become another statistic. There are more treatment options than ever to help you fight back against this disease. Your insurance company or Medicaid program may even be able to help you make the process more affordable. Don’t wait until it’s too late to get treatment.